As a patient with a neurological disease you may commission APST to manage your care needs, i.e., the provision of therapies and therapeutics, assistive technology devices and medication. 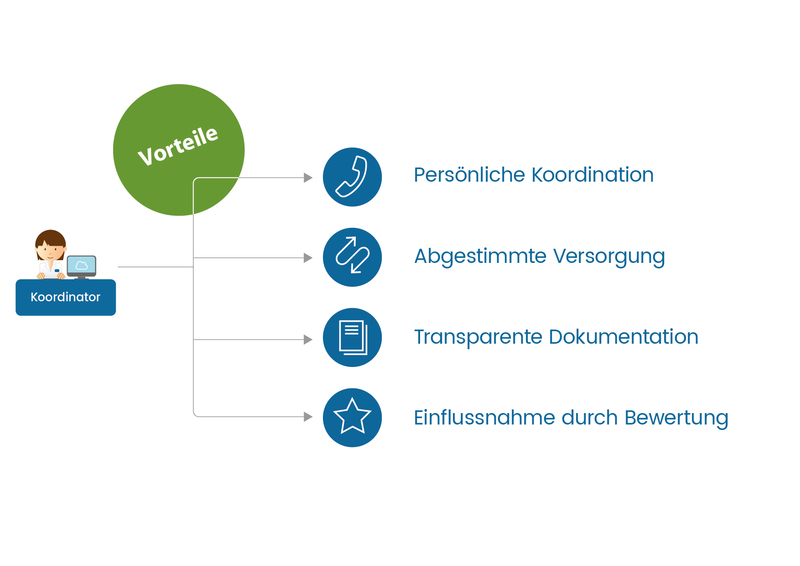 For this purpose, you will sign a Patient Information and Consent Form authorizing APST to take over your care management and digitalize your care data on the Internet platform Ambulanzpartner.de. We will create an Electronic Patient Record (EPR) for you and a health care liaison officer will contact you. Provided you are a patient and would like to join the APST network, the documents required for the process will be provided by APST. You, your relatives or any other authorized person may download the necessary registration documents from www.ambulanzpartner.de/downloads/. You may, of course, also contact us via telephone on +49 30 8103141-0 or email us at info@ambulanzpartner.de. Following informed consent, you or your authorized signatory may commission APST to manage your care in its entirety or render individual services. 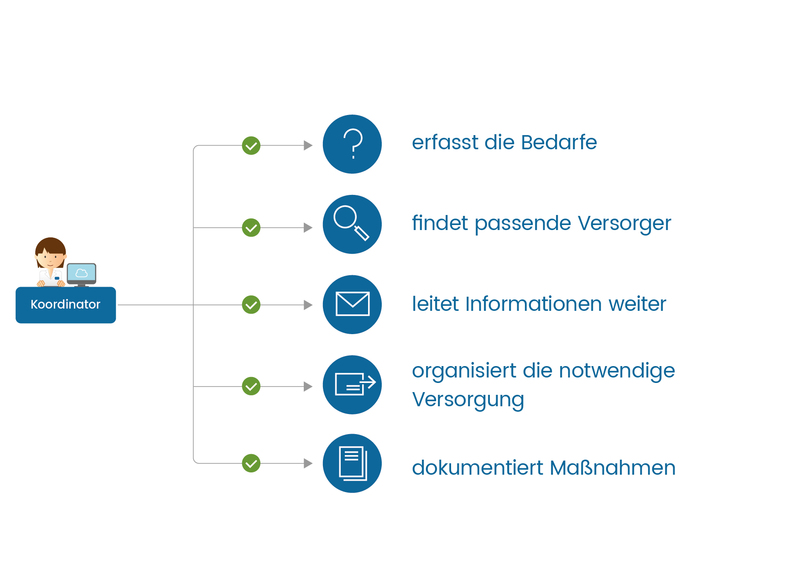 For this purpose, you or your authorized signatory will sign a Patient Information and Consent Form authorizing APST to take over your care management and digitalize your personal data on the Internet platform Ambulanzpartner.de. Once this Patient Information and Consent Form has been submitted, an Electronic Patient Record (EPR) will be created for you and a health care liaison officer will contact you via telephone. For whom does it make sense to register with APST? Generally speaking, all patients with a neurological disease may benefit from taking part in our scheme. Our medical focus is primarily on patients with Amyotrophic Lateral Sclerosis (ALS), muscular disorders or Multiple Sclerosis, various manifestations of motor dysfunction (e.g. Parkinson’s Disease) as well as stroke patients subsequently presenting with neurological syndromes. Some of the key concerns patients and their relatives have is finding the most appropriate therapies and organizing a care setting in which they are provided with ample assistive devices and therapeutics. Patients with severe neurological diseases benefit from acute care in hospitals or rehabilitation clinics. In an outpatient setting, however, they are offered little support in the organization of their needs. By joining forces with APST, the situation these patients find themselves in can become easier, relief is underway for everyone involved. The specialist APST network captures the patients’ care needs, identifies suitable providers and suppliers and coordinates any necessary measures. “The notion of network-based care provision to patients with severe neurological diseases was born out of necessity, in our endeavor to promote patient empowerment,” say neurologists Professor Thomas Meyer und Professor Christoph Münch, founders of APST. In 2010, they started a web-based care network providing care to people with severe neurological diseases. From April 2011 to January 2018, more than 9,400 patients in our network received coordinated care tailored to their needs. Extreme challenges await people who have been diagnosed with Amyotrophic Lateral Sclerosis (ALS). [Note: ALS is a neurodegenerative disease of the motor system resulting in decline in strength, muscle dystrophy or stiffness]. Life changes in the blink of an eye. Regular visits to the doctor and organizing physiotherapy and speech therapy appointments become daily routine. Moreover, patients need to tend to administrative tasks such as submitting an application for disease status acknowledgement or getting a nutrition therapist involved. Another burden can be objection proceedings between patients and health insurance companies when patients have been denied vital assistive devices. ALS is but one example that shows the enormous problems patients and their relatives are faced with in the organization of adequate outpatient care. One of the biggest challenges is to find specialists that get patients registered as eligible to receive the required care and initiate appropriate measures. Furthermore, all the stakeholders involved need coordinating: physicians, physiotherapists and occupational therapists, nutritional experts, speech therapists and pharmacists. What makes the situation even more troublesome is the fact that doctors are often not able to expend the time actually required to see to the complex ATD provision needs of patients most severely affected with disease. Providers in the assistive technology devices and therapeutics sector also encounter difficulties in mutually coordinating their processes. Many patients are unable to cope with the task of getting their lives organized or waste time and energy in the process. The APST care network offers support for the coordinated provision of assistive technology devices, therapeutics and medication. As of January 2018, our network comprises physiotherapists (n=561), occupational therapists (n=180), speech therapists (n=201), assistive technology devices suppliers (n=247), pharmacists (n=12), nutritional therapists (n=181), physicians (n=231), nursing care institutions (n=51) and outpatient care services (n=151). Our care network was initiated in 2010 for patients with ALS, primarily resident in the Berlin and Brandenburg areas. Since 2013, we have been working on our nationwide service for patients with severe neurological diseases such as Multiple Sclerosis, Parkinson’s Disease or stroke patients. Some of the key concerns patients and their relatives have is finding the most appropriate therapies and organizing a care setting in which they are provided with high-end assistive devices and state-of-the art therapeutics. Patients with severe neurological diseases benefit from acute care in hospitals or rehabilitation clinics. In an outpatient setting, however, they are given little, often insufficient support in the organization of their needs. In complex diseases that call for challenging therapies there is an increasing need for specialized care and drug therapy. By joining forces with APST, the situation these patients find themselves in can become easier; relief is underway for everyone involved. APST has a network of partners specialized in the provision of the care that patients need. 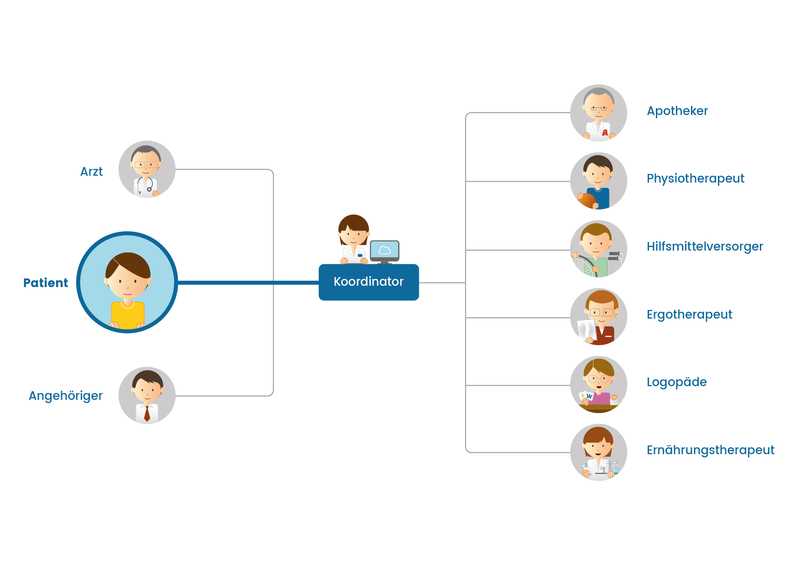 The specialist APST network captures the patients’ care needs, identifies suitable providers and suppliers and coordinates any necessary measures. It is the patient who decides if APST organizes their entire scope of care or individual parts thereof. All the care processes are initiated and implemented by a coordinator who is also a personal contact for patients and their relatives. 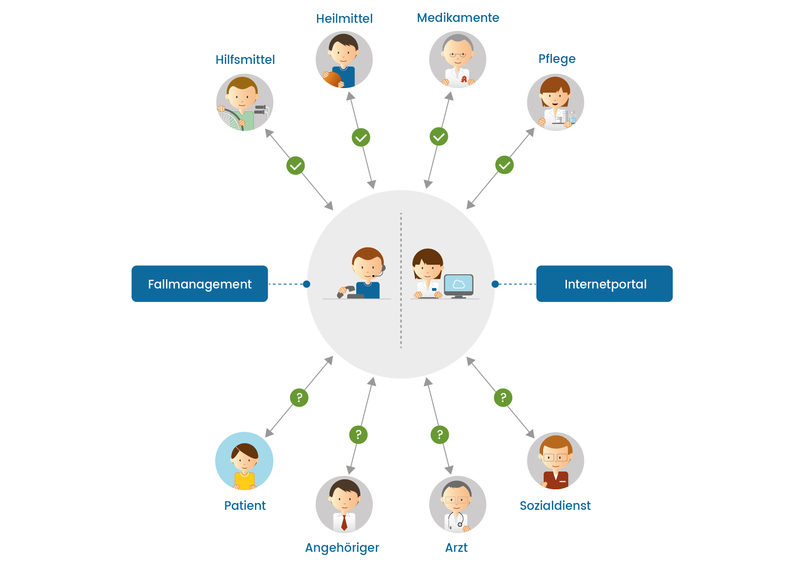 APST provides not only a network of specialist partners but also an Internet portal (www.ambulanzpartner.de) that functions as an electronic patient record (EPR). Following registration, all the relevant care data are captured, thus giving patients an overview of all the required therapies, assistive technology devices, therapeutics, care services or prescribed medication that have either been delivered already or that have pending applications waiting for approval. Furthermore, the platform serves as a digital means of communication available to all the people involved. APST supports the provision of standard care as defined by the Social Code. Responsibility for medical necessity and rentability of therapies, assistive technology devices, therapeutics and medication as well as responsibility for the medical indication remains with the attending doctor. The verification of medical necessity and rentability lies within the scope of responsibility of the medical service of health insurance companies (Medizinischer Dienst der Krankenkassen, MDK). Economic viability and rentability of care is established modelled on existing direct contracts or by rentability checks performed by health insurers who get quotes from various companies. The doctor defines the care need on an individual patient basis. APST comes into play once the indication for a specific treatment and care provision has been established. The APST organization and management structure makes the care process the doctor has defined more efficient. 15) the provider submits an application for cost absorption for the prescription device. Who are our medical partners? Our medical partners in the APST care network are doctors, relatives, nursing staff and socio-medical partners. Who are our care partners? Our care partners in the APST care network are manufacturers and providers of medical services and products including assistive technology devices, therapeutics, medication and nursing care services. 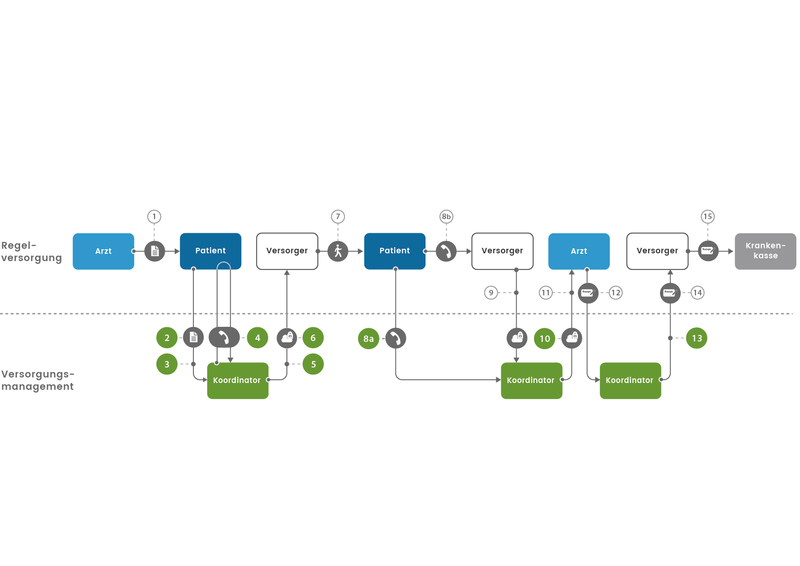 How do we finance our services? Care management and the services on the Internet portal AmbulanzPartner.de are based on a revenue model linking socio-medical added value with a business model innovation. The services and the Internet platform are financed with licenses granted to the care providers we cooperate with. 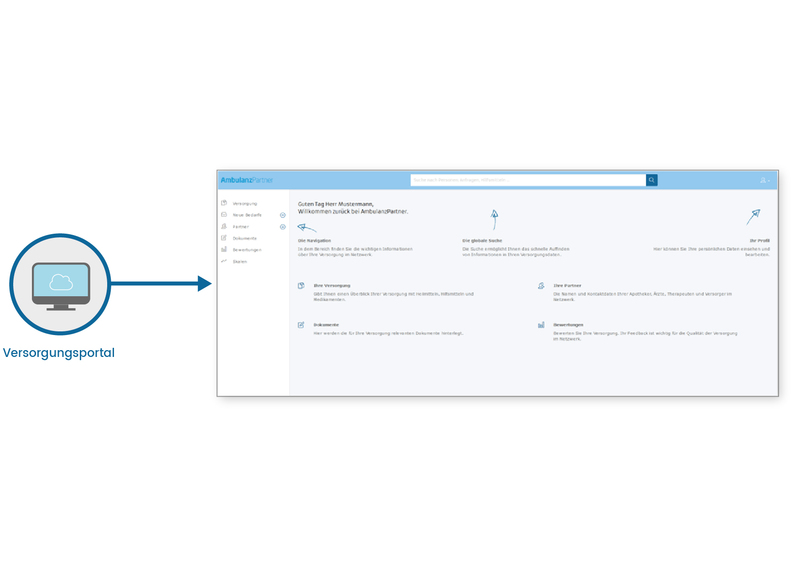 These partners are willing to pay for this setting as they benefit from an increase in efficiency in case management, quality enhancement, improved resource management and the creation of unique selling points. Our patients and medical partners may use both case management and the portal free of charge (“Shared Value Model“). The core of this principle is a financing structure that is independent of who the current health care and nursing care insurance companies are. The financing of services, innovative treatments and products in standards care usually requires adaptations in social legislation and remuneration systems which need scheduling well ahead of time. This third-party financing scheme “bridges the gap” until standard care financing has been secured. In this gap time, competitive elements in the generation of revenue are utilized. This so-called “Social Entrepreneurship“ is a business model that creates social values financed from revenue gained in the setting of a competitive organizational structure. 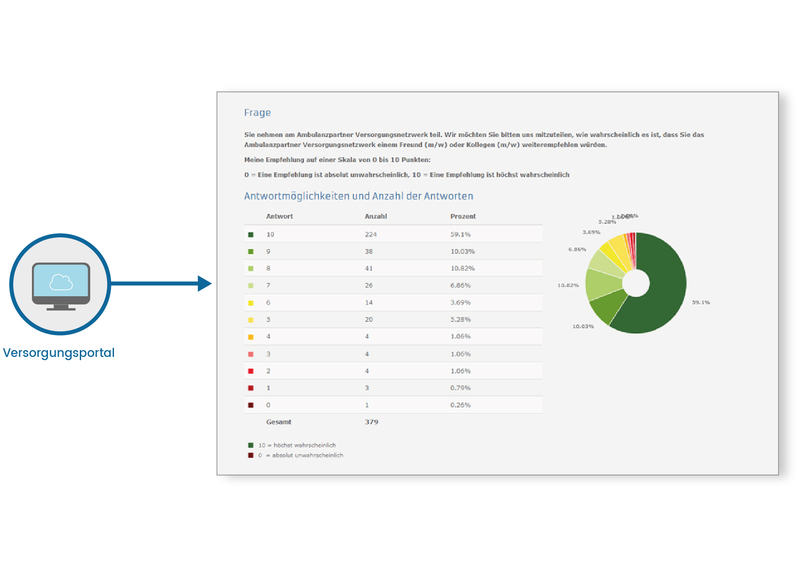 APST is responsible for data privacy and data security in connection with the utilization of the Internet platform Ambulanzpartner.de. APST operates the website Ambulanzpartner.de jointly with Charité University Hospital Berlin. The Charité servers meet the stringent data privacy and data security requirements. APST commissions the Charité with the storage of personally identifiable information. Access to the personal data for various key players (patients, relatives, coordinators, medical partners, care partners) is facilitated via an APST website application. Access is authorized and defined for each individual data set. Depending on their roles, the key players (doctors, patients, pharmacists, care providers) may view, input and manage personal data and care data in the EPR. Authorization of access to the patients’ care data and personal data captured is defined in detail and limited. Please note that care partners may access data sets only for the very patients whose care they are actually involved in or whose care they are designated to get involved in. In analogy, there are limitations for medical partners: the rights of doctors, home care professionals, nutritional therapists and other medical key players to read and/or amend data are limited to those patient records whose care they are involved in. Patients have no right to read or utilize the data of other patients managed via AmbulanzPartner.de. This particularity marks the platform apart from open social networks. The rights to read, amend and delete data are specifically defined by user groups. Patients may revoke access rights at any time. For further questions, suggestions and information on data privacy please contact our data officer at datenschutz@ambulanzpartner.de. Patients (or their authorized relatives) are given the option of rating the assistive technology devices, therapeutics and medication they have been provided with as well as their care providers, therapists and doctors. On the APST Internet portal, patients may find structured online questionnaires that allow them to rate their satisfaction with treatments, assistive devices or care provision. The rating tool generates data on the individual needs of patients while under medical care. The ratings are anonymized and made available to the various key players. For various reasons, this information is of interest to different user groups: a doctor may use the self-rating information to improve treatment while therapists and medical equipment and supply stores may use feedback to optimize their own services and products. Up to date, the focus of our work has been on patients with complex neurological diseases. Based on this experience, the APST concept may be transferred to care scenarios for other diseases, a possibility that makes perfect sense.